California is taking aggressive steps to shore up its insurance exchange in the face of mounting unpredictability about the stability of the Affordable Care Act's individual marketplace. The state's exchange, Covered California, is pumping millions of additional dollars into its marketing budget to promote enrollment, and it's giving the federal government an extra month to commit to paying next year's cost-sharing reduction subsidies before it allows insurers to hike 2018 rates. And to keep insurers from exiting the exchanges, Covered California also said it will allow those plans that incur unexpected losses due to federal policies and uncertainty, such as that around the enforcement of the individual mandate, to recoup those losses over the next three years. The ACA gives state regulators the power to limit insurers' profits. On the flip side, insurers that reap unanticipated profits next year due to changes in existing federal policies would have to lower their rates in the future. The steps taken by Covered California are one example of how state-based exchanges could mitigate the problems caused by the uncertain policy environment, said Larry Levitt, senior vice president of the Kaiser Family Foundation. For states using HealthCare.gov, federal and state regulators could also make similar moves to ensure the marketplace is stable in 2018. "Giving insurers the flexibility to make up for any losses later could convince more of them to stay in the market now," he said. "There's no guarantee that insurers will be able to raise rates in the future in competitive markets, but this policy at least assures them that regulators won't stand in the way of that." California's state-based health insurance exchange is known for being one of the most successful ACA marketplaces. It has managed to keep insurer participation high while holding annual premium increases relatively low. Eleven health plans competed for enrollment in California's individual market in 2017. The state's average rate increase for 2017 was 13.2%. In 2016 and 2015, rates rose just 4% and 4.2%, respectively. Earlier this month, Covered California announced that rates would go up 12.5% on average in 2018. Peter Lee, the exchange's executive director, said at the time that if he doesn't receive "clear and definitive policy guidance" from the White House and Congress that the cost-sharing reduction subsidies will be paid next year, the state will load a 12.4% surcharge onto insurers' silver-level ACA plans, the most popular plans for comsumers. Initially, Lee said he needed to see that guidance by the end of August. Covered California last week said it will now wait until the end of September to decide whether to increase silver plan premiums. Because most consumers enrolled in the silver plans receive premium tax credits, they will be protected from the premium increase. Covered California's big marketing budget is one reason for the exchange's success. The exchange spends about $100 million every year to promote enrollment. The funds are derived from a premium tax levied on health insurers. Covered California said it is boosting that budget by $5 million for a total of $111 million next year to be spent on radio and TV ads and a direct-mail campaign during open enrollment, which starts Nov. 1. The marketing and outreach funds are more necessary now than ever before, since the Trump administration has pulled the plug on promoting enrollment in the exchanges. Last year, the Trump administration stopped enrollment outreach during the last few weeks of the 2017 open-enrollment period. Experts said the move likely put a dent in ACA exchange enrollment, which fell to 12.2 million in 2017 from 12.7 million the year before. Even with a big budget and several health plans that support the ACA, California's exchange isn't immune to the uncertainty around the future stability of the insurance marketplaces. Anthem, one of the largest health insurers in the state, earlier this month said it is withdrawing from 16 California pricing regions, where 153,000 residents are enrolled in Anthem plans. It will remain in three regions, where it covers 108,000 people. 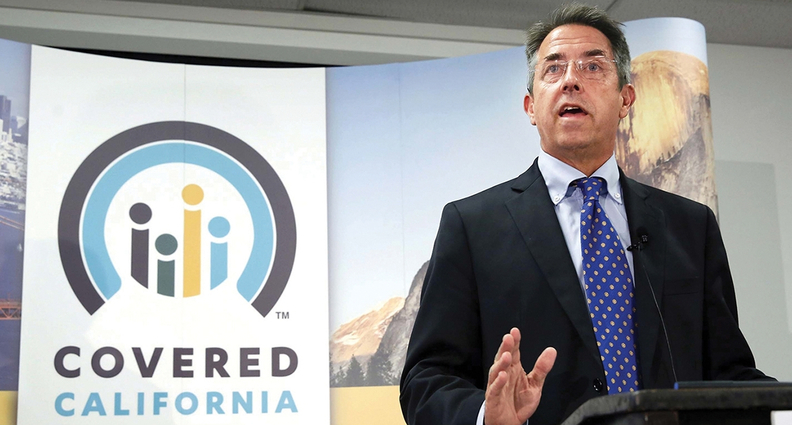 About 10% of Covered California enrollees will have to find a new plan. "The lack of clarity and direction at the federal level continues to be a challenge, and Covered California is doing everything it can to stabilize the market and protect consumers," Lee said in a statement, adding that, "We hope Congress and the administration will provide clear guidance on how it intends to stabilize the individual insurance market."